If you’re looking for something that’s a little different from what you usually serve, but without requiring a whole lot of work, this recipe is definitely for you! Rich Moroccan spiced flavors but oh so easy. 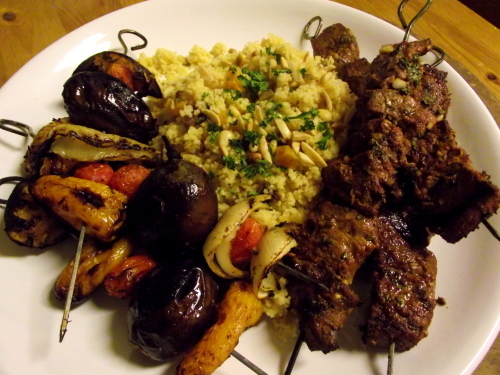 Do all the prep in the morning and then just grill the beef kebabs when you’re ready to eat! Mix the cinnamon, cumin, coriander, paprika, oregano, garlic, lemon zest, lemon juice, 1/2 of parsley and olive oil. Blend well and then set 1 tbsp aside to be used for the cous cous. Chop beef into cubes and wash veggies. You can use any type you like but I prefer the mini versions so they can be left whole. If you are using whole mini veg, poke one or two small holes in them so the marinade can get in. Put cubed beef in one bowl and veggies in another. Pour equal amounts of marinade over both, mix well, cover with cling wrap and let rest in fridge until you’re ready to cook. The longer these can sit- the better. When ready, Skewer veg & beef and grill on medium BBQ about 10-12 min, turning skewers regularly. Bring chicken stock, tbsp of reserved marinade and apricots to a boil, add cous cous, remove from heat and cover without peeking for 6 min. Add pine nuts and almonds and fluff cous cous with a fork. Garnish with fresh parsley and serve immediately with beef & veg kebabs.